Is the trunk or back seat of your car a complete mess? Got things thrown everywhere with no room? You are NOT alone. Most of us face a problem of too much stuff stored in a car or truck with no real organization. 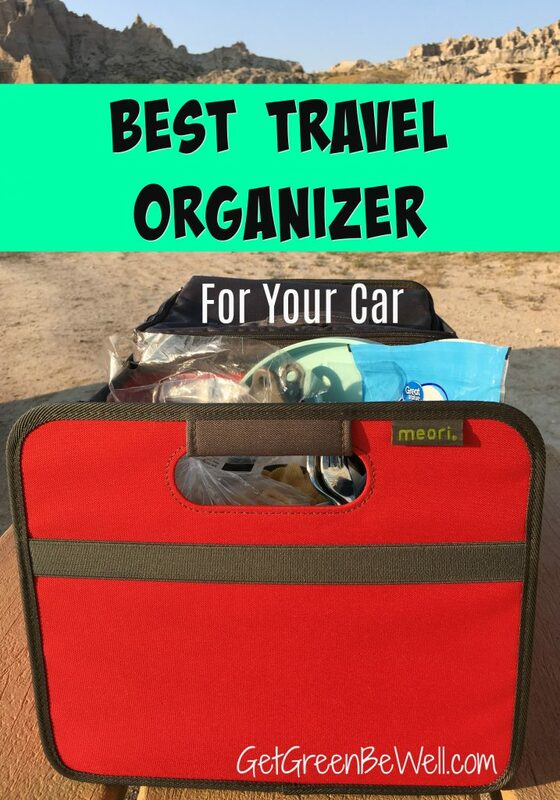 That’s why I’m so excited to share the very best car organizer that I have found, meori. The moment that I got my meori organizer system was the moment that my car finally got organized. 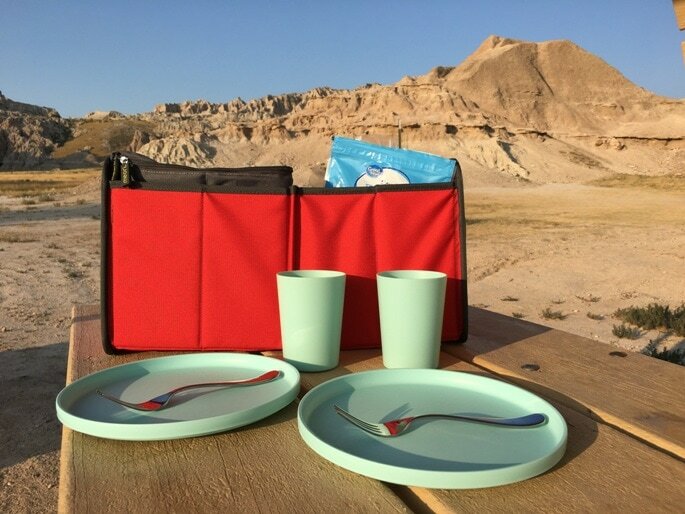 Picnicking in Badlands National Park. Living in an RV, we essentially are living out of our vehicle, too. We pull our travel trailer behind us, which means that everything we might need during the day (including food and drink) must be in our truck as we drive. It was driving me bonkers trying to put food and drinks in bags which would tip over or collapse. 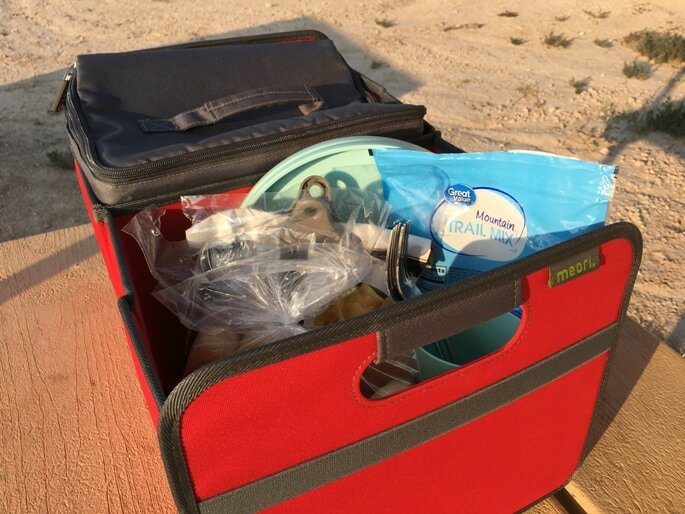 Then I had to have a separate insulated cooler for ice packs for cold drinks and refrigerated foods for snacking and eating lunch. I had stuff everywhere, and none of it was organized. So when I found meori products, I was amazed! Colorful, stylish, and modern organization cubes that are interchangeable and perfect for my car organizing needs! My main focus was to be able to organize food, snacks and drinks in our truck for the day. I also wanted something that would seamlessly blend into my life after we were done RVing across America. Such as grocery shopping, kids toys, farmer’s market purchases, sporting equipment, etc. ANYTHING that could be stored and stashed in a car or truck – I wanted it to be organized from here on out. But I also wanted as room as possible in my trunk for when I wasn’t using the car organizer. That’s why meori organizing products are so great! The base product that I got was the meori Foldable Box in Classic Large (it was a hard choice because I loved the polka dot ones in other colors, too). I chose a bright red, two compartment box that is foldable and pops up easily when you want to use it. When it is unfolded, it is seriously sturdy and supportive. The sides and bottom of the foldable organizer are not going to collapse in or be unsupportive. Each compartment has a mesh pocket and is made of tear-proof material. The stylish organizers wipe clean with a sponge. What’s so great about meori products is that you can customize what you need for your life. 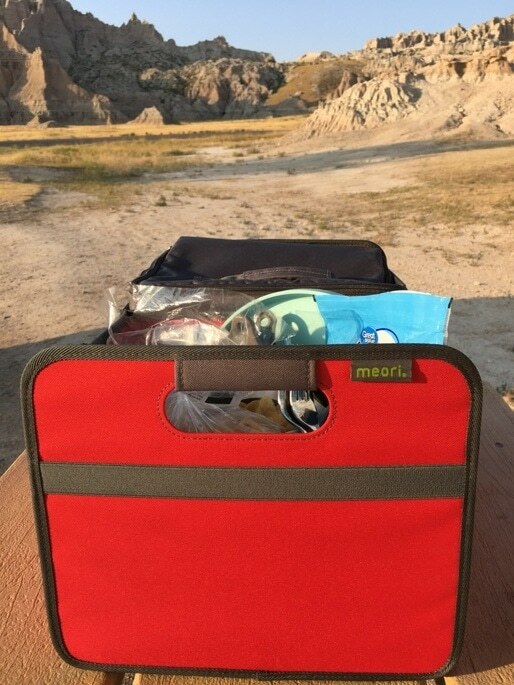 So I chose a meori picnicker and a meori cooler insert to put in each side of the organizer for my specific needs for picnicking and eating on the road while traveling. 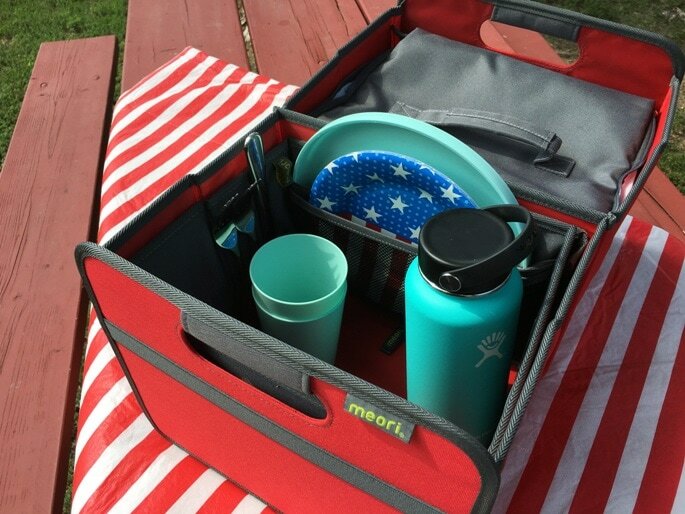 The meori Picnicker is a smart idea that wraps around the inside of a compartment and holds plates, cutting board, silverware, etc. Happily, you can store plates and silverware in the sides and still be able to put food, napkins, a tablecloth, etc. in the middle of the compartment for smart space-saving storage. Having the meori foldable boxes means that we have saved so much money being able to easily pack our own food and drinks and have them in the truck. 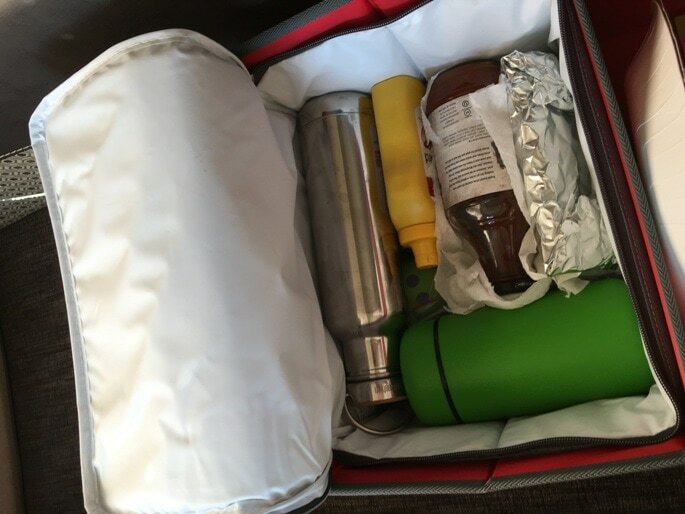 The car organizer lets me easily bring a doggie bag full of food from a restaurant, even if I still need to do some errands that day, because I can put it in the cooler without worrying about food going bad. The organizing system works seamlessly from our truck pulling our RV to my car to inside the house. 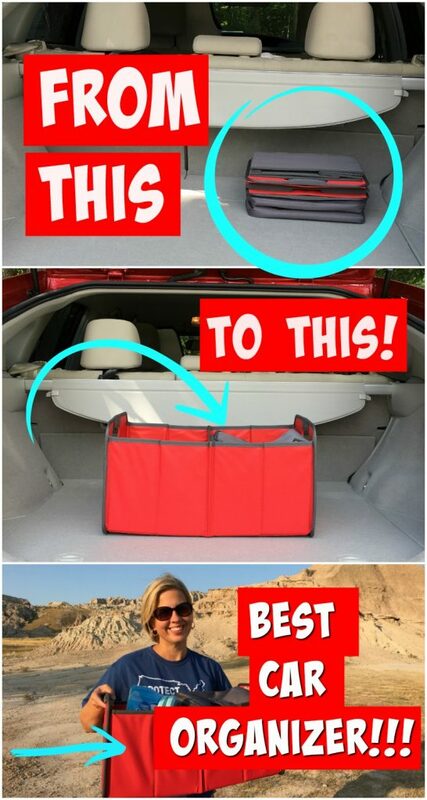 It’s the best car organizer that does not have to stay only in the car. Which saves you money, aggravation and a whole lot of time while trying to keep your life organized. 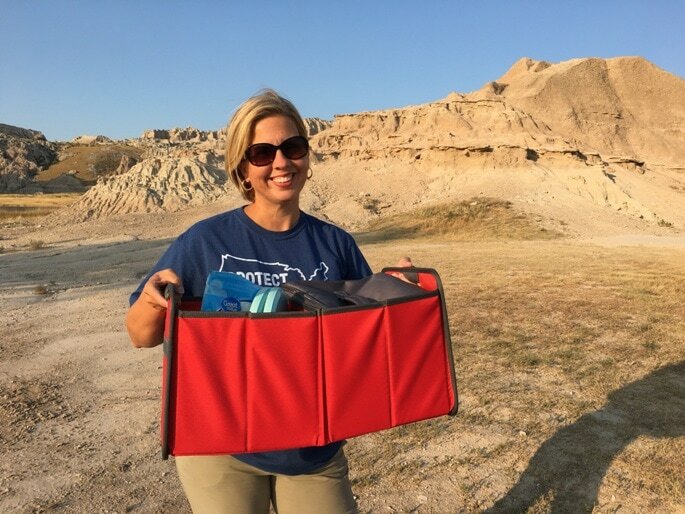 Perfect for tailgating, picnicking, travel, kid’s toys, traveling with foods for special diets, textbooks, office supplies, sporting equipment, pet toys, and even emergency supplies in the car. 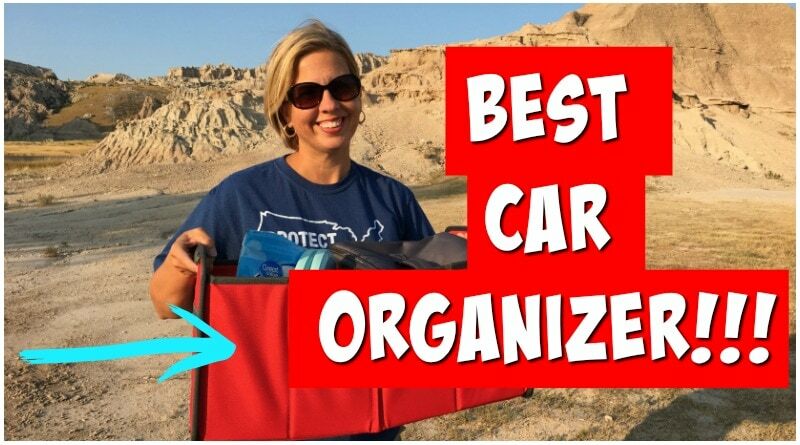 The very best car organizer truly is an organizer for every aspect of life (which just happens to fit in a car). I need something like this for the back of my car. Will have to check this out for sure. Yes!!! I love how convenient and sturdy it is. Even my mom was impressed when she saw it!